We wrote previously to urge sociologists to upload their papers for the American Sociological Association conference. On the Scatterplot blog, steering committee member Dan Hirschman wrote to invite you to the annual blogger party, now including SocArXiv. It will be Sunday, August 21 from 4pm-7pm at The Pine Box Bar, 1600 Melrose Ave, in Seattle, and everyone is welcome. Or in PDF format, in black-and-white or color. We have more than 300 papers in the archive already, from people using the temporary email upload service. Check them out at SocArXiv.org (and, of course, upload your own). They are from a wide variety of disciplines, including sociology, communications, law, political science, geography, and others. We expect the full site to launch this fall. It will have full search and discovery tools, an easy form for entering your own author information, subjects and tags, and tools for editing papers online. Our partners at the Center for Open Science are working with Google Scholar to get papers indexed by their service (they are currently discoverable by Google, but not Scholar), and with SHARE to allow setting up feeds and notifications for papers posted to the site. The paper server has welcomed two new partners, in psychology (PsyArXiv) and engineering (engrXiv). Don’t worry about our work being arbitrarily separated between disciplines, though, as it is easy to post papers to different sections in one easy upload (described here). We have much more work to do. We are organizing working groups in four areas to develop the site, its features, and governance model. 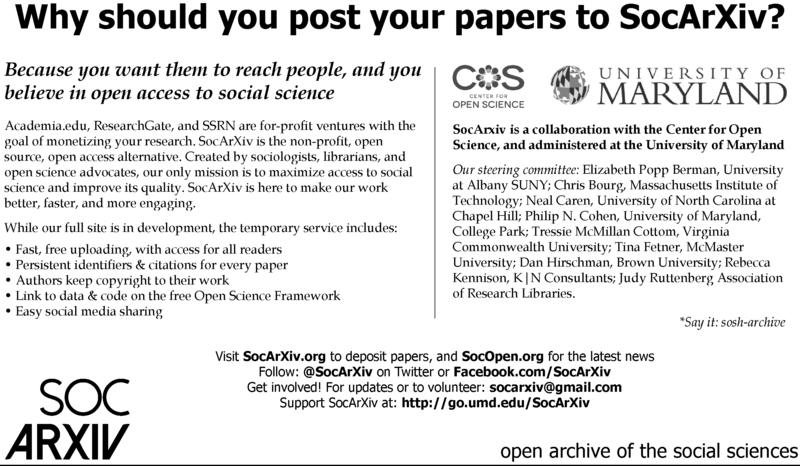 Please email socarxiv@gmail.com if you are interested in contributing to the Outreach, Governance, Interface, or Reviewing groups. Finally, we are preparing a fundraising campaign, to include individual and institutional donors. If you (or your institution) would like to make a tax-deductible contribution to SocArXiv through the University of Maryland, visit: http://go.umd.edu/SocArXiv, or email. Posted on August 17, 2016 by Philip N. CohenPosted in AnnouncementsTagged communities, conferences.